The planning hearing on traffic arrangements in College Green has been adjourned until tomorrow to consider a complaint from a disability activist. Robbie Sinnott who is visually impaired complained that he did not get documents in an accessible format. Inspector Breda Gannon was told that Dublin City Council is to make them available. She adjourned the hearing until 9.30am. Meanwhile, Independent Cllr Mannix Flynn, an observer who opposes the plan, complained that he had not received all documents in the case specifically documents in a submission from Hanahoe Solicitors concerning Parliament Street. Mr Flynn said his "rights are being trampled on" and that he is considering legal action. The five-day hearing by An Bord Pleanála on a plan to create a pedestrianised plaza began began this morning. The plan is opposed by a number of city centre business interests who fear it will discourage people from coming into the city. The hearing began with Dublin City Council presenting its vision of a tree lined pedestrian plaza with two way cycle track. City Architect Ali Grehan said the plaza is part of plans to make Dublin a more compact city. She said that as private space becomes limited, more and better quality public space needs to be provided, and she pointed to Copenhagen as an example of succcessful improvement of the public realm through pedestrianisation. She also said the plan would restore College Green as the city's pre-eminent place of assembly which "has been lost in recent times". The space would also be the "fulcrum of a revitalised and extended civic spine" from Parnell Square to O'Connell St and to Christchurch. Ms Grehan said the plan has already triggered the €100m Parnell Quarter and City Library development. Brendan O'Brien, the council's head of technical services, said bus routes will be maintained. Northbound buses can avoid College Green by using Winetavern Street. Southbound routes that had gone through College Green would be diverted along the quays and be allowed a new turn left onto Parliament St and there will be a new turn right allowed onto South Great Georges Street. There will also be a turning circle for buses travelling East on Dame Street will be situated at the axis of Church Lane and Foster Place which is situated immediately west of the Bank of Ireland. The Thomas Davis statue will be relocated to the middle of this circle, which the hearing was told was the original intended site. The hearing was also told that traffic congestion and restrictions are nothing new for College Green. In 1772 the Lord Mayor banned all "carts, cars and drays to pass" from 11am to 5pm during the sitting of Parliament "to prevent stoppages and obstructions to the great concourse of people." 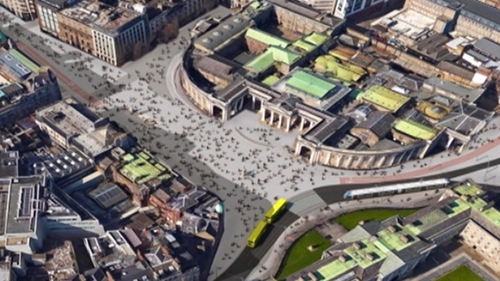 Earlier, Dublin City Council Transportation Committee chairman Ciaran Cuffe said plans for a plaza at College Green are a "win win" for the people of Dublin and the plans are designed to make it easier for people to get in and out of the city centre. The Green Party Councillor said the plaza will give some "breathing space" back to the city and will result in an "amazing civil space" that is also child friendly. Speaking on RTÉ's Morning Ireland, he said cities like Amsterdam, Copenhagen and Milan all have an open, car free space in their centres. Mr Cuffee said most people who come in to the city centre use public transport and he denied there was a "cycling agenda" within Dublin City Council, adding that the proposed space would be a draw for city centre businesses already competing with online shopping. However, the Chief Executive of the Restaurant Association has said he is deeply concerned with plans to develop the pedestrian plaza and believes there is a "cycling agenda" in the council. Adrian Cummins said cutting off taxis between the north and south sides of the city centre is bad for business and said the council has failed to consult with businesses, with many fearful the plans will have a huge detrimental effect.